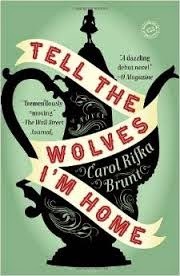 a book chick: "Tell the Wolves I'm Home"
"Tell the Wolves I'm Home"
my take: This book was very well-recieved by our book club and well-discussed. We all liked the trip back to the 1980's - although some said a few of the references were heavy-handed - with the music and clothing. It was a good reminder of where we've come with 'the AIDS' thing and how differently (at least in most of the US) homosexuality is treated today. We wondered about the narrator's reliability - June is a 14 year old high school freshman who tells the tale of her uncle's death from AIDS and the aftermath in her family. She really derides her mother, and we wondered if that's the author's way of authenticating the voice of a young teenager (in real life they seem to have so few good things to say about their mother) or if we're meant to understand that the mother is to blame. The tale isn't really about who's to blame ... more about accepting others for who they are and about following (or not) your life's passion.